can there be any more irrelevant (or even potentially painful) twigs in vases locations? or is that just Uncle the Aspidistra ?? Nah, its a birch for when you get out of the sauna, it just needs a trim before use. Well I have a bunch of twigs in a vase right here. It came with the rented flat. But more's the point, why has the property boom encouraged so many people to make their houses look like a mid-market hotel? Was round a friends the other day and they had a turn of the century old house with original chunky sink and bog, just tastefully painted. Looked lovely. 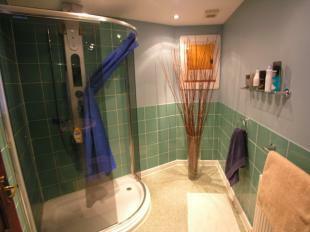 Even in a modern house a plain white suite with normal-looking taps and some clean towels would do me. OK, so its not twigs in a vase, but really. 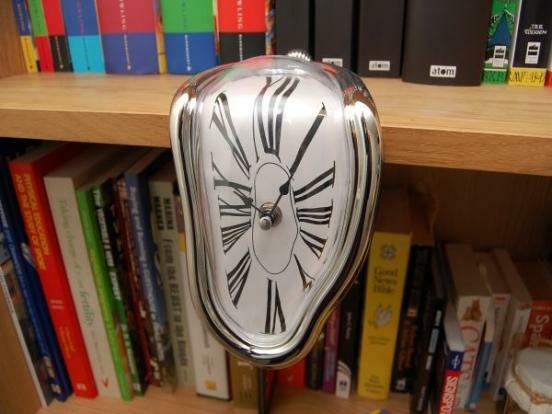 A 'Dali esque' surreal melting clock on a bookshelf. Now that is a deal clincher! I quite like that clock. The clock signifies the time warp that brought this old thread back to life. Harry Potter and Tolkien on the bookshelf - subliminal marketing perhaps? Fair enough, but it is utterly idiotic to include that picture in the prospectus for a property. It's still for sale, still the same price, still located down an entry and the twigs are still there!